Time can be infinite, Aristotle thought, because it is made up of a series of moments or instants that precede or succeed one another and do not actually coexist. One moment of time ceases to exist as the next moment of time comes into existence. Since that process can go on endlessly, there can be an infinite number of moments or instants of time. Time can be infinite, but is it? If it is, then the world that now exists has no end. Even if it had a beginning, it can go on without end, tor there is no end to time. There can always be another moment. not succeeded by a later moment. Why did Aristotle think the world is eternal? He used the word “eternal” to express his understanding that the world has neither beginning nor end. Sometimes the word “eternal” is used to signify timelessness, as when it is said that God is eternal. Aristotle used the word “eternal” in that sense, too. But, in his view, the eternity of the world is one thing, and the eternity of God quite another. To understand this distinction between the two eternities—the eternity of timelessness and the eternity of time without beginning or end—we must consider Aristotle’s understanding of time itself. Time, he said, is the measure of motion or change. Another way of expressing this thought is to say that time is the dimension in which motion or change occurs, just as space is the dimension in which material things exist. Existing things occupy or fill space. Changing things endure in time. The billiard ball that rolls from one side of the table to the other does so in a period of time. That motion takes time. The duration of the motion is measured by the number of moments of time that it took for the billiard ball to get from here to there. It follows, Aristotle thought, that time has neither beginning nor end if motion or change has neither beginning nor end. But why did he think that motion or change cannot begin and cannot end? That is a very difficult question, indeed. moved by the billiard cue that struck it. To set the billiard ball in motion, the billiard cue itself had to move. But something else had to move it. And so on. mover was not the first efficient cause of motion--the mover that started things moving. coexisting at any one time. But there can be an infinite number of things coming into being and passing away in an infinite time, or time without beginning or end. Coming into being and passing away is, as we gave seen, one type of change. Like local motion, or movement from one place to another, it never started and it never ends. The type of motion that Aristotle had most in mind when he talked about the eternity of motion was not the movement of bodies on earth nor any other terrestrial change. He looked up at the heavens and at the movement there of the sun and moon the planets, and the stars. These motions, he thought, most clearly exemplified the eternity of motion and, with it, the eternity of the world. 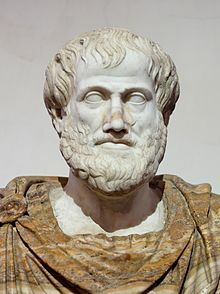 As we shall see in chapter 23, the eternity of God is used by Aristotle to explain the eternity of the world. These two eternities are as different as timelessness is different from everlasting time.